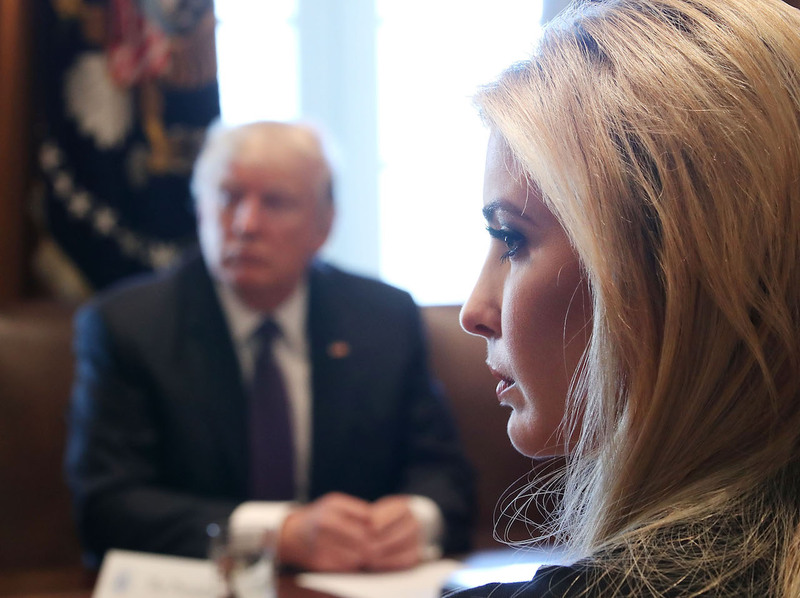 Ivanka Trump and her father, U.S. President Donald Trump, in a meeting with Canadian Prime Minister Justin Trudeau at the White House, Washington, D.C., February 13, 2017. Iwanka re (“Ivanka fever”)—the fawning admiration in which Ivanka Trump is held among some sectors of Chinese society—matters only to the extent that it is a symptom of the convergence of the kleptocratic, nepotistic trends in Chinese elite circles with the same tendencies in elite circles in the United States. No longer can there be any pretense to a purported distance between “their” so-called crony capitalism and “our” so-called cleaner version: this distinction was always a misnomer, but the kleptocracy that is embedded in American politics could somehow be concealed better from view. No longer. Ivanka merely personifies the “reveal” in a very public way. There has been a cultural strain in China—as in the U.S.—to resent/respect those who rise to the top by dint not of hard work but of family background. The fierce political struggles in China’s recent modern history over the role played by family background and social class are indicative not merely of Maoist excess but of genuine concern and ultimately ambivalence over how birth predestines social success. The dirty “secret” of American politics and society is that very similar struggles have been engaged over the course of U.S. history, albeit, until recently, in a very different idiom and under very different guises. Those idioms and guises have now more and more become one. That a very white, very blond, very patriarchally-inclined woman—who challenges nothing about an extant unjust system of social reproduction that has given her and her family circle every advantage in the world—should become an icon in China (or in the U.S.) is neither surprising nor even shocking. Unfortunately. In my opinion, it heralds nothing substantive about the U.S.-China relationship in our current moment. It is another piece of fluff that seems to forestall for just another few beats asking and attempting to answer real questions in U.S.-China relations, which are real questions in global life and death more generally. These could include the role of bombing and threats of war in maintaining ostensible U.S. military supremacy in the world; the possibilities of financial and/or economic meltdowns due to deregulated and unregulated capital investments, flows, balance of payments, etc. ; the ever-expanding tendency of China’s and America’s separate and combined global systems of hegemony to direct the concentration of wealth and resources upwards; and perhaps most importantly and alarmingly, the problem of environmental degradation, climate change, and the increasing displacement of those problems onto the global South and/or into urban ghettos and borderland zones of sacrifice (a concept I borrow from my friend Robert Stolz), whose consequent despair and restiveness will require the ever-increasing use of the forces of the national security state. These are among some of the real questions. They demand real discussion and real answers. Despite his bristly verbal stance on China, Donald Trump and his family have evoked an odd sort of empathy within many Chinese social groups. His gradual restructuring of the administration into a family business has raised criticism in the U.S., but many cadres in China are all too familiar with the nuance of this way of wielding power. The discord between Melania Trump and the president during the inauguration ceremony gained spiritual support from many Chinese housewife netizens who are overshadowed and neglected by their husbands. Ivanka Trump, the engine of positive energy in the family, not only is worshiped by Chinese white-collar women who aspire to be beautifully independent and successful, but also is viewed as a role model for China’s famed “bling dynasty” and fuerdai, the children of the wealthy elite. However, the limelight shed onto and the Chinese media gossip surrounding the Trump family seems disproportionate to the coverage of the multifaceted conflicts between China and the United States. Granddaughter Arabella’s song echoes in many Chinese households, but still not much is known about the serious talk between Trump and Xi. This phenomenon may be understood on two levels. First, it shows China’s attempt to divert domestic public attention from impending tough encounters in the bilateral relationship and maintaining calm in its backyard before embarking on the long march of conflict resolution abroad. On a deeper level, just like before a kung-fu fight, two adversaries have to baoquan, folding their fists together in front of a bow to show each other their respect and acknowledgment. Trump’s administration has made a friendly gesture, and China has responded warmly. The growing empathy towards the Trumps in China is a manifestation of the desire for grounds for mutual understanding and commonality between the two countries. The road ahead for U.S.-China relations is certainly full of difficulties, but up to now both governments have decided to start on a gentle note. Whatever they are doing, the Trump team seems to be quite adroit at the Chinese way of fighting. It brings to mind Trump’s proud pronouncement of his many years’ experience doing business in China as his advantage during his presidential campaign. Performing poppets are a feature of Chinese public relations, propaganda, and diplomacy. As a child, a friend of mine was regularly summoned to Beijing Airport from primary school to stand on the tarmac alongside hundreds of other photogenic little patriots to wave bouquets of fake flowers at visiting foreign dignitaries. Kindergarten children, trained with martial precision, regularly cute-bomb visitors to China with well-choreographed song and dance performances. Arabella Kushner is the foreign avatar of official China’s fantasies of childhood. The paradigmatic yangwawa (foreign doll), pretty and expensively dressed, she also exudes an air of listless boredom that lends her an appealing air of guilelessness. As she ploddingly chants Tang poetry and warbles the kind of ditties favored by Party leaders, the Chinese masses take it as a personal compliment: even the granddaughter of the least cultured and most China-hostile American president in memory can see that the future is Chinese. Ivanka Trump was born to brand. Her Instagram posts of Arabella’s Chinese performances, including for Xi Dada and Peng Mama at Mar-a-Lago (a kind of for-profit American Beidahe), present China with a vision of the next stage in human evolution: the Western child practically born with an understanding of the superiority of Chinese civilization, an all-singing, all-dancing future Friend of China and deep-pocketed customer/investor to boot. The oohs and ahhs for Arabella help to drown out the ews and eeks aimed at her grandfather. With the help of Arabella, Ivanka has succeeded, once again, in gilding the turd that is the Trump presidency. Many well-educated and highly independent Chinese women find Ivanka’s life riveting. Ivanka Trump is a real-life Barbie doll for many of her Chinese fans. This quintessential blonde lady represents American-style material abundance, strong purchasing power, rigid beauty, and the illusion of self-made feminism. With prevailing feminist ideas and still-dominating patriarchal beliefs in China, Chinese women often situate themselves in a perplexing web of social and political confusion in money-hungry Chinese society. Many of them endure a lot of pressure from the workplace, the marriage market or their family. Social expectations of women, in China and the U.S., cast up barriers to their professional development. However, Chinese women have found that Ivanka doesn’t have to trade family for career. Her seemingly perfect motherhood and career success “lure” women to believe in the possibility that every woman can be a master of multitasking. The cover photo on Ivanka’s public Facebook page shows a very nuanced and pretentious portrayal of her as the embodiment of modern womanhood: she is sitting in front of a working desk, holding her baby in one hand and signing working documents with the other. This deliberately-framed projection of Ivanka’s well-balanced ethic gained over 114,000 “likes.” After I showed this picture to people, one of my female professors who’s the mother of a 9-year-old, said, “this position is incredibly uncomfortable. Trust me, it’s impossible to sit like this while working.” Ivanka’s online presence often reminds me of American post-war domesticity. In many advertisements of kitchen appliances back in the 1950s, middle-class white women are always happily standing in the kitchen, neatly dressed, wearing a string of pearls and high-heels. One video from Ivanka’s Instagram account shows Ivanka encouraging her 10-month-old son Theodore to crawl. In the video, she wears a black turtleneck, along with skinny black pants, pointed flats and a headband. This video delivers a sense of typical American middle-class femininity from the early period of the Cold War. Ivanka’s social media accounts are saturated with happily-ever-after family images and updates of her fancy social/political events. Ivanka’s feminine wiles and political involvement probably evoke a form of escapism for many. Ivanka gained her popularity through Ivy league education, good looks, and elitism, in the same way, as Naicha Meimei, the Tsinghua and Columbia-educated online celebrity who married the founder of a giant e-commerce company. This admiration often comes out of some people’s ill-perceived idea of sophistication and intellectually informed taste. Many of Ivanka’s worshipers are ill-informed Chinese middle class who fail to examine Ivanka’s agenda and consider themselves highbrow connoisseurs of so-called U.S. upper-class culture. They probably think, at least paying attention to Ivanka is much “healthier” than focusing on the Chinese Kim Kardashians or Korean pop stars.